Processor controlled crude oil distillation system for automatic operation following ASTM D-5236 for distillation up to a final temperature of 600° C AET. The crude oil is charged into a 33 L stainless steel flask for charge of 10-22 L of crude oil and heated by an electrical heating bath. The heating bath has 3 horizontal heating zones which can be activated or de-activated according to the filling level of the flask. All rising vapors are passing through a DN 100 stainless steel column and are condensed in an integrated vertical condenser. An additional high performance condenser made of borosilicate glass which is located on top of the column construction is required to condensate all remaining light boiling components. All condensed product is being discharged by means of a tempered gear pump into the fraction collector, which provides 10 receivers of 1 L volume each. Full receivers can be replaced during operation. The discharge process is being performed independent from the current system pressure (atmospheric or vacuum) to avoid any manual discharge in between the different pressure conditions. 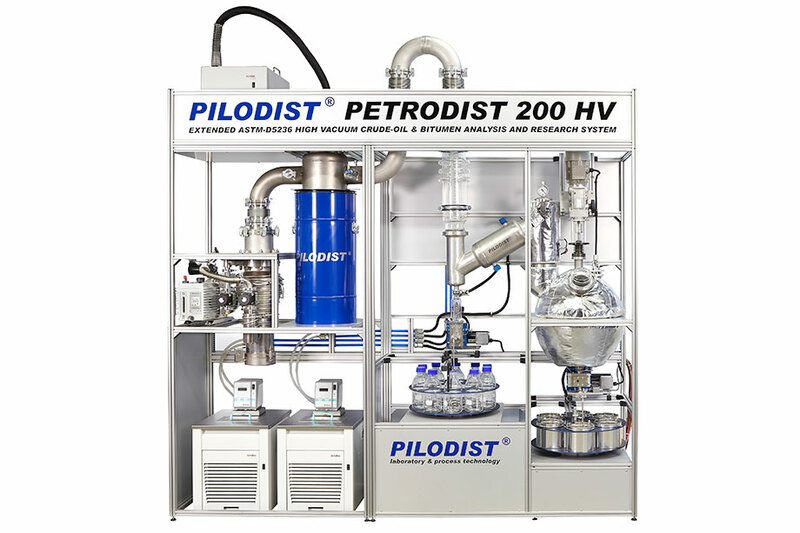 The whole processing of the distillation can be visualized all the time by glass connecting pieces made of borosilicate glass 3.3, a viewing window in the flask, condenser and glass intermediate discharge receiver, located between pump and column. The distillation is performed in several pressure steps (atmospheric and vacuum) until a final atmospheric equivalent temperature (AET) of 600°C. During distillation residue samples can be automatically be discharged into another fraction collector for the residue via a vacuum tight gear pump. Once the final temperature is reached and distillation is finished the hot residue in the flask can be discharged as well from the bottom of the flask. The atmospheric and equivalent temperature is calculated and visualized automatically. To keep all products liquid during the whole process including discharge all lines are being tempered by a circulation thermostat. A second high performance circulation thermostat for the main top condenser with high cooling performance ensures condensation of all products. The safety concept of the system includes a cold trap with a simple drain valve to protect the vacuum system. For automatic evaluation of the distillation and distillation curve all weights of sample, cuts and residue needs to be entered via laptop into the data station.